I admit, I’m a big fan of Daredevil’s costume. It’s simple and bold at the same time, and it gives our hero a distinctly sophisticated look. 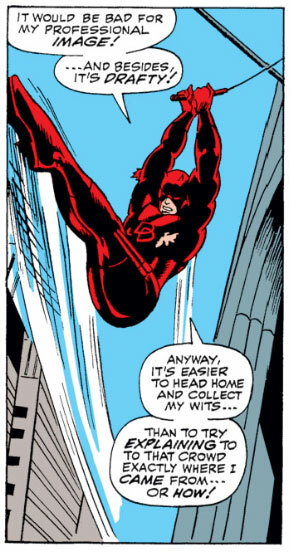 Even out of costume, Matt Murdock is a good dresser. He wears the kind of fancy suits you would expect of a New York lawyer, and only looks less than polished when he goes nuts over some random tragedy and forgets to shave. Harsh, harsh but fair. They do like to let the ginger beard tell a story all its own. Great little post, it’s these little things about old comics that always crack me up. look, one of Colan’s trademarks: “DD swinging with legs joined and extended”, recognizable by the lenght of his feet exceeding a meter. One of DD’s more endearing traits during this time was a sort of self-deprecating, almost self-parodic humor. He wasn’t afraid to laugh at himself. Thus in this scene my take on it is that he’s not really hugely embarrassed by the torn costume. But it bothers him a just a bit. He’s vain. So he laughs at himself about it.